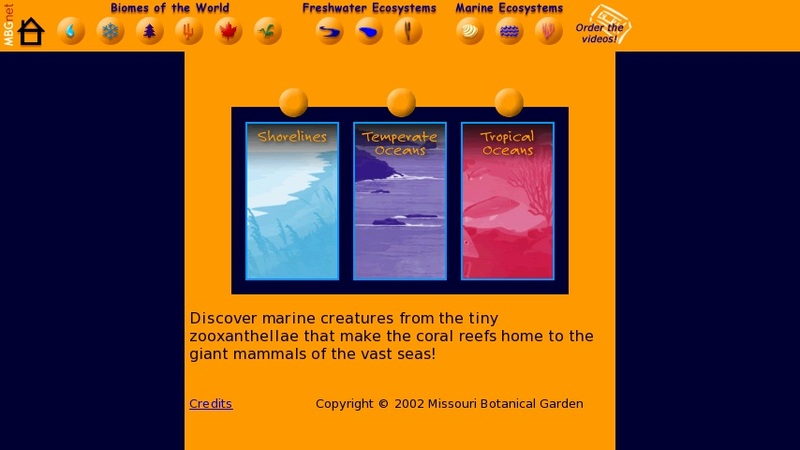 Marine ecosystem introduction to shorelines, temperate oceans, and tropical oceans. Shoreline topics cover sandy and rocky shores, barrier islands, tide pools, estuaries, salt marshes, mud flats, mangrove forests, tides, waves, currents, and shoreline animals. Students can learn about temperate ocean zonation, light, forests, patterns, and animals. The tropical oceans chapter features coral reefs and tropical ocean animals. This site would provide a comprehensive introduction for a marine ecosystems or an ocean science unit.